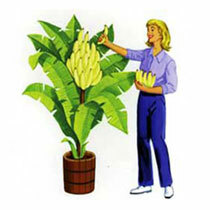 Now you can grow your own delicious bananas at home with the Incredible Indoor Banana Tree. You could harvest dozens of tasty bananas from just a single plant. Plus it will save you money too. Why pay up to $5 for a bunch of bananas, when it will only cost just pennies to grow your own with the Indoor Banana Tree. In addition, bananas from the market can be over ripened and rot faster. But when you can grow your own, you can pick them fresh off the tree. Using the Indoor Banana Tree, you could create your own tropical paradise of bananas in your very own home. You and your family will enjoy these potassium packed fruits whenever they want. Not only are bananas tasty but they are also good for you and makes healthy snack. In addition to potassium, they are also high in Vitamin A, Iron and Phosphorus. The Incredible Indoor Banana Tree sells for $10 plus the cost of shipping and handling but right now you can take advantage of a buy 1 get 1 free offer. You’ll receive a second Indoor Banana Tree plant free by paying the extra shipping for it. The plants comes with a 30 day money back guarantee.